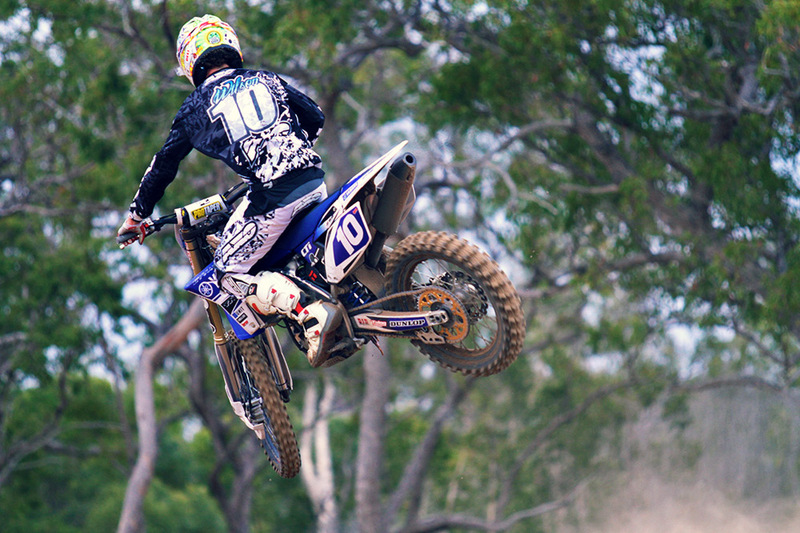 CDR Yamaha’s Billy Mackenzie broke through for his first Monster Energy MX Nationals, Australian Motocross Championship, victory of the season at round seven in Hervey Bay, Queensland, on Sunday, 28 July. The Scotsman used consistency to capture the overall, carding a pair of third place finishes, combined with his five points scored in the GoPro Super Pole to secure the overall. It was the CDR Yamaha team’s first round win of the 2013 season. “I’ve done a lot of work this week and really put in the hours,” said Mackenzie. “I’ve got a good setting with the sand, which was the key to this weekend, so I wasn’t having to change things and I could optimise settings on the day. Second overall for the round was new championship leader Matt Moss (Motul Pirelli Suzuki), who was second in Super Pole before struggling to sixth in moto one. He made amends for it in moto two however, getting out front early and streaking off to a dominant win. Billy Mackenzie’s five-point boost from Superpole proved decisive today. Image: Simon Makker/Makkreative.com. Moss missed the round win by a single point, however he now leads the championship over arch-rival and longtime leader Todd Waters (Motorex KTM) by a slim margin of two points. “In the first race we just had our suspension too hard and didn’t have a sand tyre on the bike and we just weren’t going forward,” said Moss. “The last race we changed suspension, changed tyres and my bike felt so good, it was completely different. Completing the podium was Jake Moss (Campbell Mining Suzuki) after finishing runner-up in both motos, but his overall result was ruined after officials excluded him from riding outside of the course during his flying qualifying lap. Despite positing the fastest lap, Moss wasn’t credited Super Pole points and was forced to settle for third overall. “I came here feeling good,” said Moss. “I got the fastest time in practice, by a little bit, and Superpole, I got the fastest lap time by two seconds and they decided to take it off me because I went outside the banner which I think is ridiculous, especially on this track. “The line was going that way and I just went it, it was still inside the tyres and it’s just disappointing to lose that way. 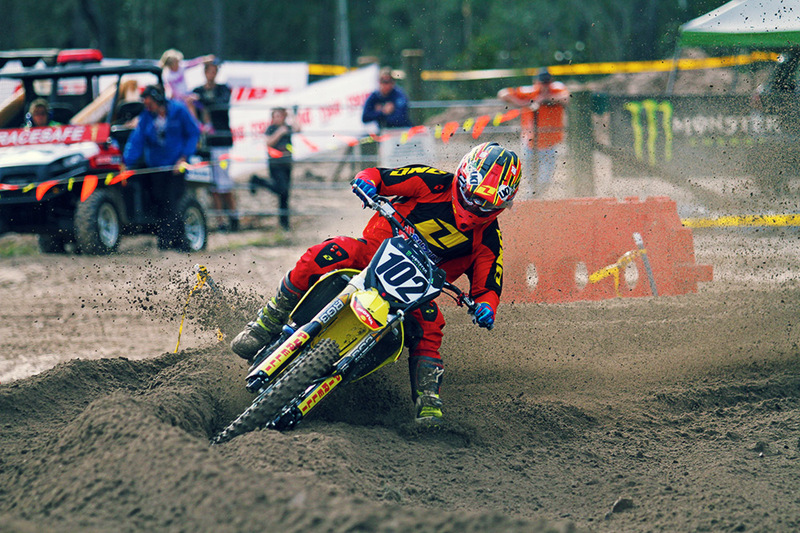 Matt Moss is the new MX1 class leader after a strong showing at Hervey Bay. Image: Simon Makker/Makkreative.com. South African guest Gareth Swanepoel was a surprise first moto winner for Carlton Dry Honda Racing, slicing through the top five in the final stages of the moto for the team’s first MX1 race win of the season. Fifth in moto two ranked him fourth overall for the round after he failed to qualify for Super Pole. Former series leader Waters ended up fourth for the weekend as he continues to recovery from collarbone surgery, posting a determined fourth in both motos. Kiwi Cody Cooper (Motul Pirelli Suzuki, 5-6) was sixth, followed by last year’s Hervey Bay round winner Lawson Bopping (CDR Yamaha, 10-7), Jay Marmont (Monster Energy Kawasaki, 8-9) and Cody Mackie (Zero Seven Motorsports Kawasaki, 9-11), who filled the top 10 overall. The Motul MX2 ranks saw Serco Yamaha’s Luke Styke clinch his sixth overall win in seven rounds, inching ever closer to the 2013 championship as he now holds down a commanding 91-point lead with just three rounds remaining. 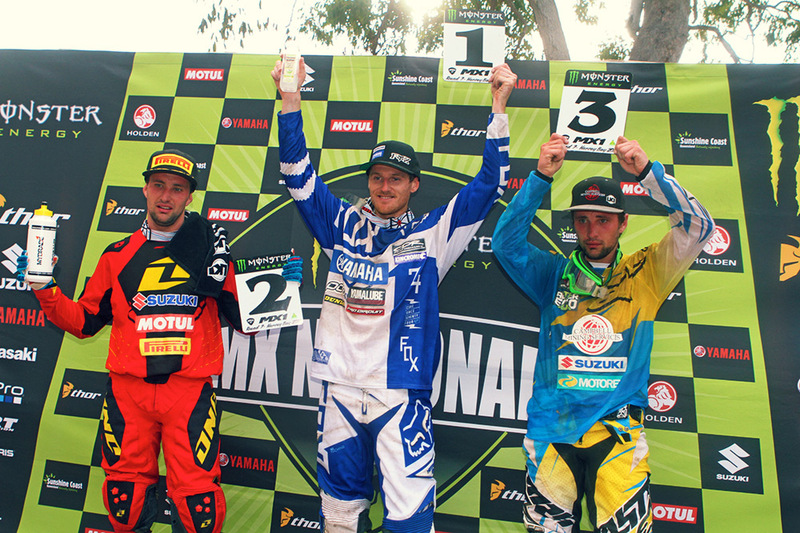 CDR Yamaha’s Billy Mackenzie scored consistent finishes to secure the MX1 class win over the Moss twins. Image: Simon Makker/Makkreative.com. 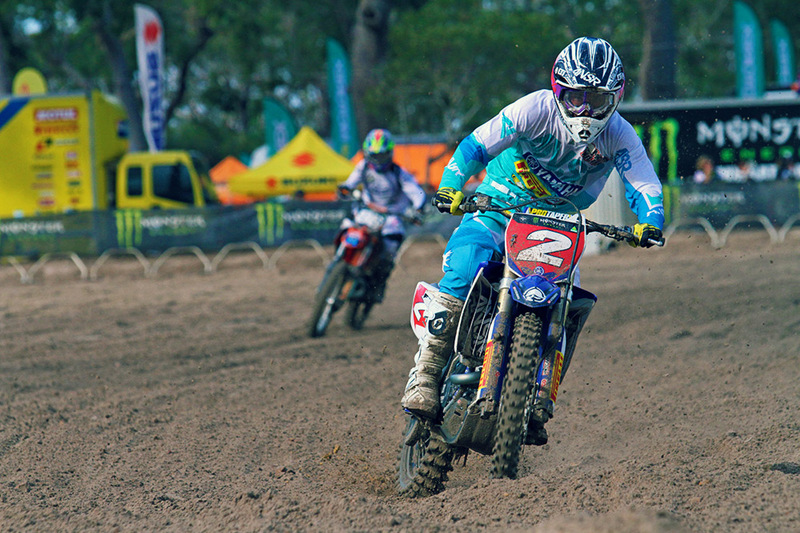 Styke won both motos in style at Hervey Bay despite qualifying second, however challenges from both number one qualifier Kale Makeham (Tunetech Racing KTM) and Kade Mosig (Zero Seven Motorsports Kawasaki) kept him honest throughout the round. “It’s been a good weekend at Hervey Bay,” said Styke. “In the first moto I got the holeshot and led from the start to finish, and pulled a pretty decent gap and felt really comfortable with that. “In the second I missed the start and was pretty well sixth or seventh. I made up a good solid three or four positions in the first few turns but then got super aggressive arm pump. In a mirror of the Appin podium, Makeham finished runner-up with his 3-2 performance, while Mosig completed the top three with second in moto one and third in moto two. For Makeham it was another convincing performance aboard the 250 SX two-stroke and he was again happy to challenge for regular podium positions in his rookie MX2 campaign. Luke Styke extended his lead of the MX2 class. Image: Simon Makker/Makkreative.com. “The weekend was pretty good for us, we took a few steps forward,” said Makeham. “I managed to come out and qualify first which was good because I really wanted that inside gate. “We got off to a good start and were running in second in the first moto but I ended up putting it down which was disappointing. “We came out in the second moto with a holeshot which was really cool, and then a few guys blew past me which was a bit of a reality check. Mosig continues to race through the pain of a knee injury sustained late in the mid-season break, leading laps during moto two riding the 2014 version of the KX250F. “It’s good to be back on the podium,” said Mosig. “After the first moto I was really pumped on coming out again and was feeling really strong at the end, but I just fell a little flat and when I was in the lead and I made a bunch of mistakes. 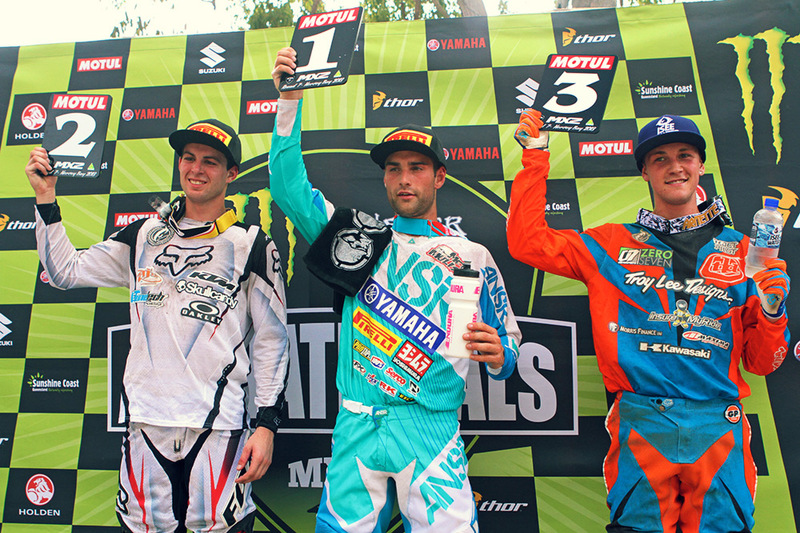 Kale Makeham and Kade Mosig joined Styke on the MX2 podium. Image: Simon Makker/Makkreative.com. “I just didn’t have the energy to keep moving forward. I got passd by Stykesy, and then passed by Makeham. It’s a hard thing. I’m dealing with a knee injury at the moment and in that first moto I caught it quite bad and had to get an injection in between and was just pushing through the pain. Fourth overall for the weekend was Ryan Marmont (Raceline Pirelli Suzuki), putting forward a consistent effort of 4-6 finishes. Yamaha privateer Beau Ralston raced to his best result of the season with fifth overall thanks to 7-4 results. Positions six through 10 were filled by Brock Winston (Choice Motorsports KTM, 5-5), Dylan Long (KTM, 6-9), Rhys Carter (Suzuki, 9-7), Kayne Lamont (Choice Motorsports KTM, 8-10), and Geran Stapleton (Raceline Pirelli Suzuki, 14-8). Daniel McEntee (KTM, 12-12) narrowly missed a top 10 finish with 11th overall. Carlton Dry Honda Racing new recruit Jackson Richardson’s debut with the team lasted just two laps, before an incident ruled him out with a suspected broken femur. Jay Wilson broke through for his first win of the season. Image: Simon Makker/Makkreative.com. GYTR Yamaha rider Jay Wilson won his first Pirelli MXD overall of the season with 1-2 finishes in the Under 19s motos, climbing to third in the standings and hopeful that he’ll be in title contention come Coolum’s season finale in September. “It’s definitely a good way to come back into the championship,” said Wilson. “I’m a fair way down on points but it’s all this – making up points – and we’ve taken the win today and I’m pumped. Wilson near made it a clean-sweep for the weekend, however series leader Hamish Harwood (KTM) was able to bounce back from fourth in the opening moto to win the second. That sealed him second overall for the round and he now holds a 28-point advantage in the standings. Third overall this weekend was Wilson’s teammate Joel Dinsdale, who was second in moto one and third in moto two. He’s now fourth in the championship points chase. Title contender Jack Simpson (KTM) was fourth overall, retaining second in the series, while Corey James (Yamaha) completed the top five overall with 8-5 finishes. The Scott Rookies round was won overall by Queensland rising star Nathan Crawford with back-to-back wins for Yamaha Junior Racing, heading Jed Beaton (2-2) and Zak Small (4-3) for the overall. Wilson Todd was third in moto one, but didn’t start the second moto. The Monster Energy MX Nationals will resume in two weeks time at Swan Hill in Victoria on Sunday, 11 August.